I have been researching quartz vs granite for sometime now and found this to be very interesting. 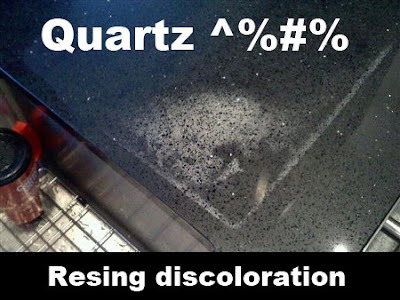 Quartz manufacturers make some outrageous claims about the quality and durability of quartz. Well I found this image cruising around the web and come to find out the manufacturer denied the warranty of the product and left the fabricator out to dry to deal with the customer. Is this heat? Is this chemical related? Who knows but its not right that's for sure. No matter what anyone claims for natural stone or man made quartz products, use common sense, avoid placing hot pans and harsh chemicals on your counter tops. this is just UGLY.. and I am blown away that the company did not bone up and replace the product.